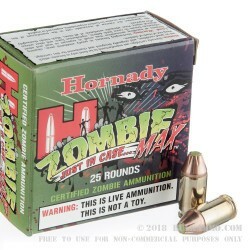 Whether you're thoroughly invested in the possibility of a zombie apocalypse or just want some nice ammo for the gun that you keep in your purse or jacket pocket, you'll find these .380 ACP rounds from Hornady to be a fantastic choice. Hornady is an American company with deep roots in the shooting industry that go back as far as 1949. 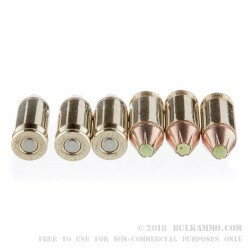 They gained popularity for their unique projectile designs and also produce highly rated finished ammunition which saves shooters the trouble of reloading. 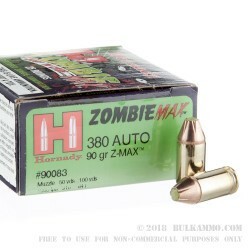 These Z-MAX cartridges are built similar to their Critical Defense pistol rounds and utilize FTX (Flex Tip Expanding) bullets with a green tip instead of a red one. The 90-grain FTX is perfectly weighted to the .380 Auto caliber and produces controllable recoil which is especially important when carrying small-framed pistols. The FTX itself is designed to expand on impact while maintaining its momentum thanks to a ribbed cannelure at its crimp point; this results in a bullet that will penetrate into vital zones while successfully slowing down as it imparts maximum damage to a threat. The cannelure also serves to lock bullet into its reloadable brass casing for the preservation of dependability and accuracy. The polymer tip itself prevents clothing from clogging the bullet and preventing expansion. Hornady powers the load using proven non-corrosive Boxer primers and clean-burning powder.